The electrical functions of the driver's seat are active approximately one minute after opening the front door. They are deactivated approximately one minute after the ignition is switched off and in economy mode. 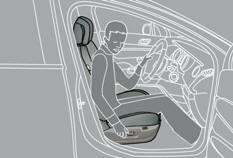 To adjust the angle of the head restraint, tilt its lower part forwards or rearwards. Turn the knob manually to obtain the desired level of lumbar support. Check that no object, either on or underneath the seat, could hinder its movement. 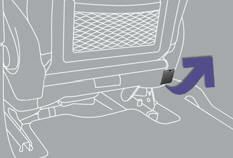 To make the operation easier, place the head restraint in the low position (if the seat is in the fully forward position). 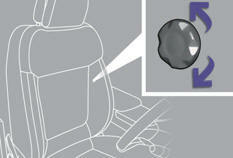 If your vehicle is fitted with the video pack, place the protective cover on the head restraint. 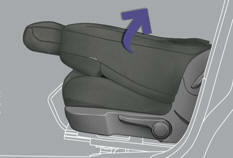 Lift the control, located behind the seat, then guide the seat backrest forwards. 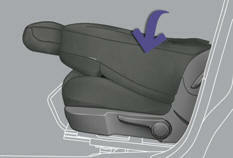 When the seat backrest is in this position, the seat behind it and the centre rear seat must not be occupied. 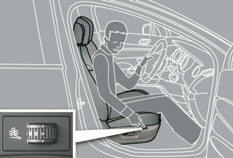 This position, associated with that of the rear seats, allows you to transport long objects inside the vehicle. The maximum weight on the seat is 30 kg. 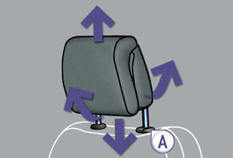 Guide the seat backrest rearwards until it locks in place.